Houston, TX- Saturday, March 23, 2019 – Yolanda Alvarado, a well known and respected civic leader, invited community leaders to a meeting with legislators serving in new positions. 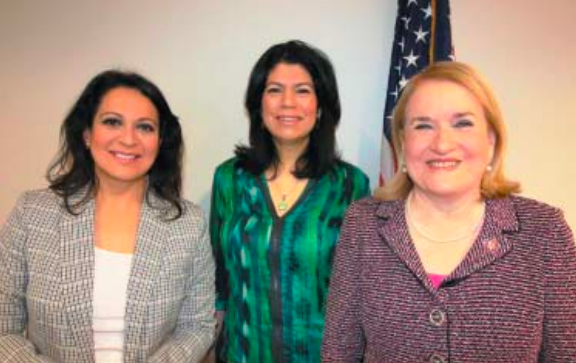 Elected officials present were Congresswoman Sylvia Garcia of the 29th Congressional District, Senator Carol Alvarado of Senate District 6, and State Representative Christina Morales of District 145. Congresswoman Garcia said, “It’s been somewhat of a challenge adjusting to the cold freezing snowy weather and its effect on one’s ability to move about in D. C., but I’m managing it okay. State Senator Carol Alvarado is serving her first term in the Texas Senate. She is Vice-Chair of the Senate Select Committee on Texas Ports and represents Senate District 6 encompassing the Eastern portions of Harris County along with the cities of Baytown, Pasadena, Galena Park, Jacinto City and South Houston. The Senator stated this issue has impacted South East Harris County heavily and raised concern across the city. She’s expecting all agencies involved in this incident to strictly enforce any standards that were not met by ITC leading up to this disaster. She anticipates ITC will be held fully accountable for damages caused and to be charged accordingly. On a larger scale, Alvarado feels this accident brings to light questions of safety standards, environmental protections and regulatory laws for all companies similar to ITC. She’ll be making sure the communities in South East Houston have all possible safety precautions in effect and they’re enforced consistently. “We must ensure that these companies are acting as good neighbors, with the wellbeing of the residents surrounding them in mind,” Alvarado said. Representative Morales, who was elected just two weeks ago, said, “I’ve just been in office a few days and still getting settled into my office, but I’ve hit the ground running. “I’m meeting with other local area representatives to educate myself on bills and pending legislation so I can ensure we have as much support as possible to help improve the lives of my constituents and the citizens in the East Harris County area,” Morales said. “I’m very concerned about the health risk of the East End residents after the ITC fire. I want an environmental investigation on the long-term effects on the water and air quality from this catastrophe, and to determine the impact it’ll have on our economy,” she said.